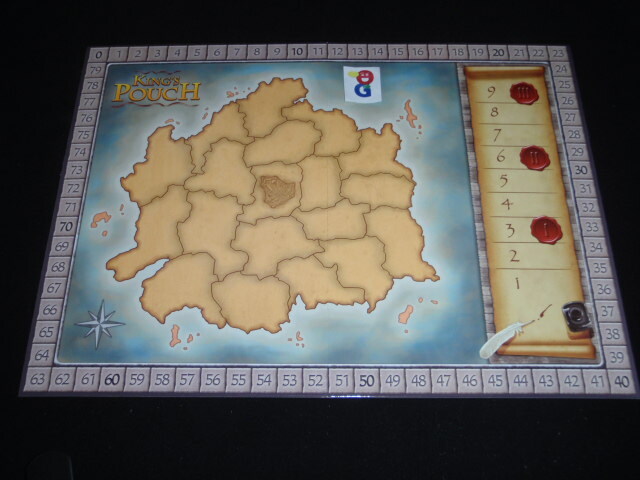 King’s Pouch was one of a number of games at Essen 2014 that used a “new” mechanic – pouch building. This mechanic is sort of a brother-in-law to the deckbuilding mechanic started by Dominion back in 2009. In this game, you get a pouch in which you keep wooden pieces – you will draw pieces out of the bag (akin to dealing cards from a deck in a deckbuilder) – though the way the bag works means that you can more easily “shuffle” the bits in the midst of a round. But, before I get ahead of myself, let’s get back to the game. In King’s Pouch, players are feudal lords fighting for control of their Kingdom. The Kingdom is represented on a central board – a single island split up into a number of different regions. Each player also gets his own player board that represents his particular capital city. Each city starts with an identical set of four buildings, but the rest of the spaces are empty and each city will grow in its own special way to grant its owner specific abilities and actions. Each player starts the game with 4 blue common citizens – there are wooden hexagonal cylinders. These are placed in your city’s ready area to be used in the first turn. Your pouch starts the game empty, but you will soon be filling this up with more wooden bits. Players also place a castle marker of their colon on the central kingdom map – the starting locations are evenly spaced out following diagrams in the rules. There are a number of character cards which are set up next to the board. Five of the cards are in play for every game, and an additional four cards (from a supply of seven) are added for a 4p game. These cards will not change for the duration of the game. There are three decks of cards: red (military), yellow (commerce) and green (religion) – each color has cards for each of three eras. The decks are shuffled by color and era. The game is played over 9 rounds – each round follows the same pattern of phases. There is an interim scoring round that happens at the end of rounds 3, 6, and 9. After the scoring in the 9th round, there is also a final scoring phase. In each round, the first thing that happens is that any old building cards are discarded and 2 new cards from each color are revealed. Note that there are no building cards revealed in the final round. Additionally, the turn order for the current round is now set – this is done is order of highest prestige points. If there is a tie for prestige points, the marker on top of the VP space goes first. Then, going in this new turn order, each player goes through the three phases of his turn before play passes to the next player. Placement phase – in this round, you place citizens from your active area into buildings in your city. The citizens must be placed in areas that match their color. The citizens that start in the active area were determined at the end of the previous round (or for the first round , you placed 4 regular blue citizens there in setup). Whenever you place a marker into a building, you immediately trigger the effect of that building space. You may choose to not take the effect. If there are buildings with multiple actions, the top slot must always be filled first before the bottom slot can be used. Many of the buildings will allow you to generate new citizens. The card will tell you whether to place them in the rest area of your board or the active area. If they are placed in the active area, you will be able to use those newly gained citizens this turn! You may also generate coins and armies in this phase. There are no markers for these things; you simply remember how many of each you made to sue in the next phase. Additionally, there are a few buildings that do not have a space for a citizen. These buildings can be activated once per round without needing to place anything there. Construct a building – you can choose from any of the available building cards (each round starts with 6 available). You need to pay gold coins – the cost for each building is found on the card. You do not have any gold markers in the game, you simply remember how many gold coins you were able to create in the placement phase. You take your selected building and place it face down on your player mat. You may not have more than one building with the same name, and you can only build one building per turn. If you need to, you may use your turn order card to generate one extra coin. 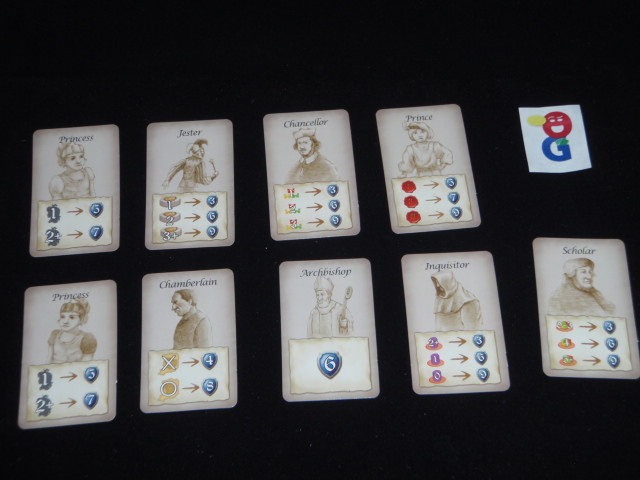 Claiming a character card – there are 9 character cards available at the start of the game. You can choose to claim one of these unclaimed character cards by paying a cost of (2 gold plus 1 gold per each of your markers already on a character card). These cards will score you points at the next scoring round (at the end of rounds 3, 6, and 9). Occupying territories – you tabulate your collected army points from the placement , you can use these to make your move on the central Kingdom board. You must expand into a territory that is adjacent to one of your own controlled territories. To move into an area, you need 1 army point per distance away from your starting castle PLUS one army per each marker of your opponent that is in that region. You then score 2 points if that region was empty OR 5 points if that region had been occupied by an opponent. You could attack a castle of an opponent – this can only be done once a turn, though. The castle is not removed. Instead, a purple corrupt official piece is placed in the attacked player’s rest area, and the attacker gains 5 points. Finally, the central region of the kingdom is the Palace. If you control this region during the rest phase of your turn, you are allowed to draw an additional citizen from your pouch. In the rest phase, you first convert any unused gold and army points to VPs at the rate of 1:1. Then, you collect 3 VPs if you did not use the coin on your turn order card. All of the played citizens on your board are moved to the rest area in the bottom right. Then, you draw 5 new wooden pieces from your pouch to place in your active area for the next turn. You draw 6 if you control the Palace. At this point, it’s important to note that there are two different shapes – the blue and purple pieces are hexagonal cylinders while the yellow/green/red pieces are cubes. You are allowed to feel for a particular shape to increase your chances of drawing a particular color. You are also allowed to look into the bag prior to drawing to see what is in the bag (and of course mixing up the contents before drawing). If your pouch is empty and you still need to draw, you fill your pouch with all the pieces in your rest area AND you add one purple corrupt official from the supply to your pouch as well. Finally, you flip over any purchased buildings from this round and add them to your city. You score prestige points for territories on the Kingdom board – you score 1/2/3 VPs per marker on the territory board after rounds 3/6/9. These markers remain on the kingdom board. You score prestige points for claimed character cards – each card has its own scoring criteria – you score points equal to the level of criteria met on the card. 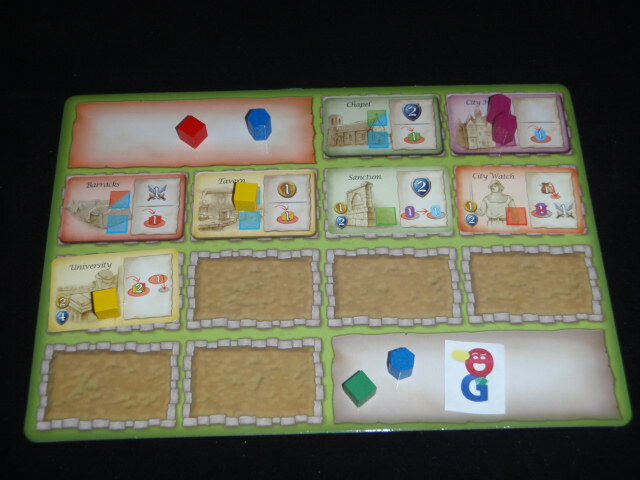 Unlike the markers on the kingdom board, the markers on the character cards are removed after scoring so that they can be reclaimed for the next scoring round. If you are at the end of the 9th round, and thus at the end of the game – there is a bit of final scoring to be done as well. The player with the most VPs wins. If there is a tie, the player with the fewest purple corrupt officials wins. King’s Pouch is a very interesting take on the deck building concept – managing the contents of your bag and the order in which you draw things out of them is central to your success in the game. While the pouch is analogous to your deck in a deck builder, there is a subtle difference which helps to set it apart. First, the use of different shaped pieces is key – you are not just drawing the next card off the deck, you are able to choose the shape you want to try to get the color you want. Additionally, the wooden pieces that you draw don’t have any special abilities with them (unlike the cards in most deckbuilders) – instead, the special abilities are found on the building cards which you power with the drawn pieces. There are a lot of choices to be made each turn in King’s Pouch, and that’s what I love about it. There are many viable ways to score VPs – through building cards, through progress on the Kingdom map, and via character cards. Each of these requires different resources, and you need to figure out what you are able to do each turn with your drawn pieces to maximize your scoring potential each round. A lot of your strategy will be determined by the building cards that you are able to buy – as you need them to give yourself different choices in your actions. Depending on how your buildings line up, you might be able to set up a chain each turn where you are able to generate a number of citizens each round to immediately use – which allows you to power many of your buildings and also keeps you from having to restock your bag that often which would reduce the number of purple Corrupt Officials in the bag, thus avoiding many -2VP penalties at the end of the game. The Character cards have significant VP bonuses, but the cost to acquire them escalates with each successive one. Thus, you have to choose them wisely – and then once you have taken control of one, you then have another demand on your attentions as you then have to try to meet the demands of those character cards to maximize the score you get from them. Finally, you should make sure that you do not neglect the play on the kingdom board. First, being able to attack an opponent’s region will give you a quick 5 points for each conquered region. If the board allows, you can focus on your armies and perhaps score 15 or 20 points if there are enough regions close-by to be conquered. Furthermore, you would probably like to have a buffer of your own controlled regions around your castle – if your opponents are able to conquer your castle area, you will end up with extra purple Corrupt Officials in your pouch which will not only gum up your drawing but also cost you VPs at the end of the game. Finally, getting to the center of the board, if only for your turn, can prove to be quite valuable when you are able to draw a 6th wooden piece from your pouch for the next round. King’s Pouch feels different from the other main pouch builder from Essen ’14, Orleans, as this one has a bit more direct conflict on the kingdom board and there is a bit more individual strategy play as each player gets more different buildings in King’s Pouch – whereas the action choices stay more static in Orleans. It would be hard to choose one over the other, and lucky for me, I don’t have to. Both of the games will likely earn a place in the permanent game collection. 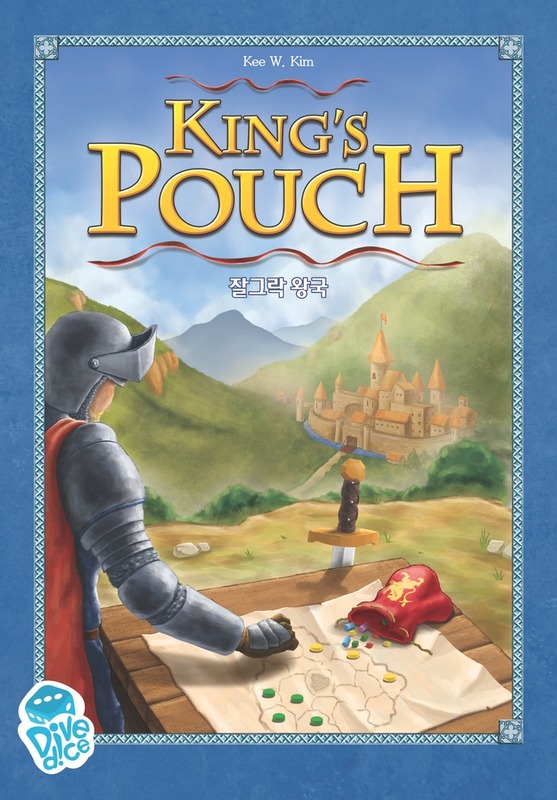 Eric Martin: (1 play on a pre-production copy) A single play of King’s Pouch is hardly enough to review it given that you’ll spend much of that game figuring out everything that you did wrong in the early rounds and fighting to overcome those blunders. Well, that was my experience anyway. Your actions pile on top of one another in a meaningful way, with the past always coming to the present again and again. The game board feels like a throwaway when you first set it up since it seems like you’ll be focusing on your bag and your board, but you need to devote time to conquering that ground or else you’ll just be handing tons of points to others, giving the game to anyone but you.